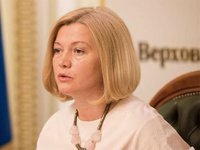 First deputy chairwoman of the Verkhovna Rada, Ukraine's representative in the humanitarian subgroup of the TCG, Iryna Gerashchenko, confirms Kyiv's readiness to exchange 36 Russian citizens convicted in Ukraine for crimes against territorial integrity on Ukrainian political prisoners on the territory of the Russian Federation. "We are waiting for Russia's reply to our proposal: take away 36 of yours and give ours! Give the command to your puppets in ORDLO to take away several dozen criminals and give our heroes," Gerashchenko wrote on her Facebook page on Tuesday. She also noted that Ukraine is ready to pardon several dozen criminals involved in the war in Donbas in the ranks of pro-Russian bandit groups, "to take out our guys from ORDLO." According to her, the representatives of ORDLO in Minsk are trying to play the Kremlin scenario about "exchanging all the confirmed ones on all confirmed ones" and claim "that there are only 20 Ukrainian citizens in their dungeons and demanding that we release 300." "We insist on another formula: Ukrainians illegally kept in the Russian Federation are on the list of identified individuals, thus the whole world knows where Sentsov, Sushchenko, Balukh, Karpiuk, Panov, Kuku, Kolchenko, and others are kept," Geraschenko said. As reported, Ukrainian film director Oleh Sentsov, illegally sentenced in Russia, continues his hunger strike for the 93rd day with a demand to release all Ukrainian political prisoners in Russia.